I thought that we could have some where , Where we can talk about any thing and have a Beer and a laugh , Like Captain Black Jack real name Jack Campbell of the Dauntless . This is the story of the Alliance and the Syndicate who have been at War for a century and the battles that have taken place , The story starts where he is Captain of the Merlon fighting against the Alliance , His ship is destroyed and he is adrift in an Escape Pod that has malfunctioned , The Escape Pod is found buy an Alliance War Ship 100 years later . This is a collection of books written by John G Hemry , If any of you guys have read this series of books please let me know if the are any good . @ HK , Thanks for that titbit but have you read the books , Are they worth buying . Now, just reviewed them in the past before I ever got into space sims. I was more of the Horatio Hornblower by, C.S Forester, reader back then. Stories about battles on the high seas. They are more or less, real graphic novels. Telling you about the instances of what happens in those battles that what takes place. About how a sailor's sabre, cut off a pirates head and things like, 'the cannonball went right through my crewman's stomach,' etc.... I thought they were really cool books. It also explained to me why, sailors had long hair in ponytails too. Their reason was, with the ponytail, they would braid it and have a steel shaft embedded in it. Why? In case of a sword fight, the steel bar would prevent their head from being cut off if someone was to come up behind them during a fight with another sailor and protect them from getting their head chopped off from behind. lol I've had long hair every since. Even though, he is completely fictional, it did include a bit of History about the Royal Navy. Flying Colours is a Horatio Hornblower novel by C.S. Forester, originally published 1938 as the third in the series, but now eighth by internal chronology. It describes the adventures of Hornblower and his companions escaping from imprisonment in Napoleonic France and returning to England. At the end of the previous novel, A Ship of the Line, after attacking and severely damaging a superior French squadron with HMS Sutherland, Hornblower had to surrender his ship to the French. He and his surviving crew are imprisoned in the French-occupied Spanish fortress of Rosas on the Mediterranean Sea. From the walls of Rosas, Hornblower witnesses an English raid leading to the final destruction of the French ships he immobilized. Springtime comes and the river is in perfect condition for travel. Disguised as a fishing party, the escapees make their way to the port city of Nantes. There, they change their disguise to that of high-ranking Dutch customs officers in French service, using uniforms made for them by Marie and the staff of the Chateau. They manage to recapture the cutter Witch of Endor, taken as a French prize the year before. Manning it with a prison work gang, they take the ship out of the harbour and rendezvous with the British blockading fleet. Returning to Portsmouth, Hornblower, in common with any other captain who has lost his ship, faces a court martial for the loss of the Sutherland. However, he is 'most honourably' acquitted by the court and finds himself a celebrity for his exploits in the Mediterranean and his daring escape from France. He is received by the Prince Regent (the later King George IV), who makes him a knight of the Order of the Bath and a Colonel of Marines (a sinecure providing worthy officers with extra income). Together with the money from prizes taken while he was captain of the Sutherland and from his recapture of the Witch of Endor, he is finally financially secure and free to court and marry Lady Barbara. Tales of adventure back in those days. Yes you are right i have a dvd box set of tv series Hornblower and some of the stories happen just like you sead . Last night the Freelancer global server went down for about 3 hours I think , Microsoft who owned the server decided to shut it down , But as we see the server is still running , My question is does Microsoft still own the server or is there some one else running it , And where is it . It's not a MS server anymore, it got a workaround, around that. It's the Gun Server out of Texas, I think? I believe that's why the, Global Server Workaround mod was created, in order to bypass the old MS server. Nowadays, it's in almost every mod so you don't have to install and activate it in the FLMM. I still have a couple of those in my FL Library Folder. As a matter of fact, now that I'm thinking about it, I still have to use it with my mod, I think? Those that run a Disco 4.84 server have to use it too. I think most Vanilla servers still use it if, they haven't added it in? Idk about that for sure. Anyone is welcome to correct me here if I'm wrong. I was on Starport Website today and read this article with great interest , And i was just wondering what your thoughts are on this Topic . 10 years ago on March 4th, 2003, Freelancer was released. To this day, Freelancer remains to be the reference in space action and role playing games. Chances are that this year will be a very interesting one for the game. Interest in the genre is rising again and we might see some major mod releases this year. Also, it has been rumored that a digital release of the game could happen very soon. However, we also need to take a look at the more distant future. Freelancer is getting older and so is our website. Hopefully this year, I will try to get away from Xoops (our current CMS) and relaunch the website using a major forum software (phpBB or SMF) as the main website element. We will keep the Wiki and the Forge. As regards the site content, I think our strength is covering space games with support for modding and private servers. So far, there have been almost no reasonably good games in this segment since Freelancer. With Star Citizen however, this might change. If there will be proper support for modding and private servers, expect Star Citizen to become a major focus of our website. Also, Infinity might be another future game that we could cover. Sounds good to me especially if, I can keep my Senior Status there. Pour me another round bartender. These posts are very interesting. I'll have to visit this place more often. Well i got the books T L F six in all and what a read , In some parts it reminds me of Freelancer and i didn't realise the things you can do with a Battle ship in space , also what you need to to keep a Battle Fleet in space . A surviving Syndic heavy cruiser led two light cruiser and several HuKs straight for Titan. "Damn," Geary whispered . He hadn't been watching Furious and Implacable , which had finally completed there long wide swing through space and instead of aiming for more Syndic capital ships had focused on the closest threat to the auxiliaries , Now the two Alliance battle cruisers tore past , riddling the Syndic heavy cruisers ,blowing up one light cruiser and shattering the second , while the battle cruisers escorts wiped out the HuKs . The syndic battle cruiser seemed in a hopeless position , but as Duellos brought Courageous , Formidable , and Intrepid in from a killing shot, the syndic pivoted at just the right moment and accelerated downward and to port , Duellos's battle cruisers were moving so much faster than the syndis that they couldn't react in time and could only hurl a few long range Hell Lancers at the enemy ship . But Brilliant, Inspire and Opportune were far enough behind the first Alliance battle cruiser to be able to react to the evasive maneuver and close enough behind that the syndic couldnt maneuver again before they got within range . The syndic battle cruiser rolled and pitched slightly under the push of its working maneuvering thrusters . The change in aspect allowed the battle cruiser to bring its surviving Hell Lancers to bear , and the charged-particle streams shot out , targeting Brilliant as she, Inspire, and Opportune altered there own vectors slightly to pass just to starboard and above the syndic warship, Brilliants shields flared from a few hints while she and Inspire hurled volleys of Hell Lancers into the weak shealds of the syndic ship. The syndics shealds collapsed under the barrage , then the Alliance Hell Lancer lashed through the enemy battle cruiser , slicing apart the hull , bulkheads, equipment , and any crew members unfortunate enough to be in the way . May have to order those, myself. That was just a fraction of the action . The sydics where ahead, then behind , the moment of contact was incredibly brief , Automated targeting systems aiming and firing as the Warships tore past each other at a contact speed of almost six thousand kilometres per second . 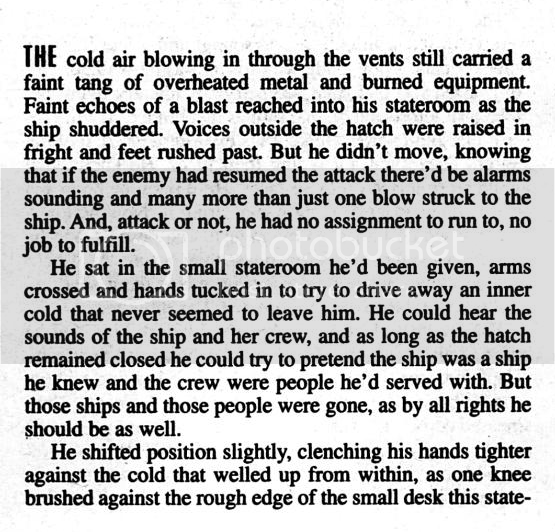 Dauntless's hull shuddered as enemy hits registered on here shields , Geary tried to remain focused on the big picture as watch-standers called out reports. The syndics had volleyed Missiles and Grapeshot at the expected position of the Alliance Fleet , the great majority of those shots passing overhead as the Alliance warships went beneath them. By contrast the Alliance grapeshot couldn't miss , slamming straight into the comparatively weak centre of the sydic flotilla . At short range and with the Alliance formation so compact , The dense barrage of steel ball bearings it had fired annihilated the light cruisers and HuKs in its path , Blossoming flashes of light marking the death of the escorts , More lights flared as Alliance grapeshot slammed into the shields of the syndic Heavy Cruisers , Battleships , and Battle Cruisers in the centre of the Flotilla , As the opposing Warships shot past each other, Hell-Lancers tore into targets and from the Alliance Battle Cruisers and Battleships Null Fields Blossomed to engulf part of the syndic combatants. I may order them yet.